When it comes to packaging and ingredients, design is everything. A sleek external design makes a product that much more enjoyable to use. A well-designed formulation keeps you using it over and over. I couldn’t rave more about Etta + Billie, a green beauty brand that makes superior design look effortless in both form and function. Guests at my apartment experience it firsthand via Etta + Billie’s fantastic Grapefruit Cardamom Lotion, which I keep right next to the hand soap in my bathroom. Handcrafted in San Francisco, Etta + Billie was born from founder Alana Rivera’s desire to step away from an office job and instead, truly create. The line is named after Alana’s grandmothers (I love both of those names, by the way!). I choose to keep this particular Etta + Billie lotion on my bathroom counter for daily use for a few reasons. One reason appeals to vanity. I absolutely adore the packaging. It’s sleek, unisex and non-intimidating for my male guests (boyfriend and brothers, you freaks) to use while maintaining an apothecary charm that any green beauty lover would swoon over. Another reason appeals to the sense of smell. Grapefruit Cardamom? Yes please. Nobody can resists a bit of citrus and spice, and the scent isn’t overpowering or extremely feminine by any means. You just get bright yet warm, fresh citrus in a hydrating lotion that, with just half a pump, covers your hands and leaves them feeling silky smooth. Bear in mind is that this lotion is preserved using phenoxyethanol, so if that’s something you’re avoiding, this one’s not for you. With a simple and effective moisturizing base like this — aloe, cocoa butter, sunflower oil, coconut oil and vitamin E — it’s impossible to not get a heap of hydration with every use. But, the blend is so light and silky, making it a perfect post-wash hand lotion that’s never greasy and easily absorbed. 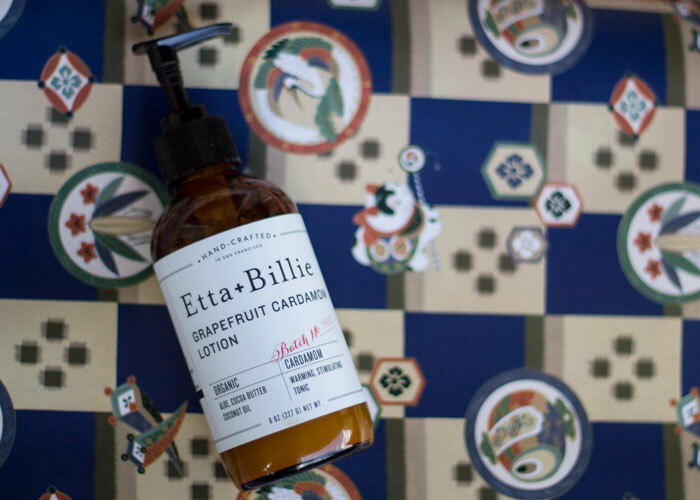 While Etta + Billie’s Grapefruit Cardamom Lotion isn’t designed as a hand lotion per se (it’s a body lotion), I think it’s the perfect lotion to keep in the bathroom when you want to shield your skin from the drying effects of a foaming soap. I’m not sure that this lotion would be enough for someone with extremely dry skin to use from head to toe, but layered with an oil on top, it could be the perfect base. If citrus and spice is your jam, here’s a wonderful starting point for your post-shower moisture and scent ritual. For those who live in warm and/or humid climates, this would be a perfect everyday body lotion to keep you soft and never sticky. All in all, for someone who’s said a billion times before that she’s not a lotion kind of girl, I love Etta + Billie’s Lotion. I think the packaging is spot-on and would make a wonderful housewarming gift (or any kind of gift), and the formulation is smart. This brand has something special going for it — look for more reviews to come (soap, skin balm, body scrub, oh my!). Have you tried anything from Etta + Billie? What are your favorite lotions? What lotion do you keep next to your bathroom soap? Tell me in the comments section!